My Way Didn’t Work. Now What? I have some good ideas. I bet you do too. At least in our own mind they seem like good ideas. Here’s one thing life has taught me, a lot of my good ideas didn’t turn out so well. But as a person of faith, there is a different way. It’s God’s way. When I take the time to seek out the Lord’s direction, things seem to go much smoother and work much better. It’s this simple: God blesses the work that we do according to the Lord’s direction. If it’s my idea, no matter how good it is, well…not so much. It’s a lesson that I, and I suspect I’m not alone, need to learn over and over again. The scripture today, from Judges 6 is The Lord calling and commissioning Gideon. Gideon takes a good look at reality, and tells the Lord, “I can’t.” God says, “You will.” Gideon again says, “I don’t see how that’s possible.” And the Lord says, “Because I will be with you. This is my idea, my plan, my way.” With that assurance from The Lord, the wise and faithful Gideon signs on. Now, when something is of God, and God is using me to help accomplish it, it gets done and usually succeeds beyond what I could have hoped for or dreamed of. Here’s what this scripture reveals again to me today. Even when it’s my good idea for God, my plans, hopes, and dreams often come crashing down. It’s not that it wasn’t a good idea or a good program, it’s just when something is “of me” it’s probably not going to work. Now, when something is of God, and God is using me to help accomplish it, it gets done and usually succeeds beyond what I could have hoped for or dreamed of. This is an invitation and challenge. God is inviting us to go to work for the Lord. The challenge is finding out what is “of the Lord”, taking the time to be sure the work we do is “of the Lord”. For me, I’ve learned that figuring out what is “of the Lord” comes through prayer, bible study, worship, and seeking out the wisdom of other Godly people – for me it’s mentors, peers, my wife, my family, and some close trusted faith-filled friends. Prayer: Lord, lead me and guide me. Give me wisdom to know and hear your voice, and give me the courage to answer the invitation and challenge whenever you come calling. Amen. Some days and some situations are just difficult – Single parents, unemployment, painful and debilitating health issues…the list could go on and on and on. Today’s verse reminds me that we are not alone in our difficulties, and that God is still with us, loving us, and caring for us whether we caused the difficult situation or life thrust into the lion’s den. This is where we find hope. Hope in God, not to keep us out of the lion’s den, but to see us through it. Daniel in the lion’s den is a famous story from the bible. Long story short, Daniel, while serving The Lord, has made enemies. Daniel’s enemies convince the king to issue and edict that no can pray to anyone for thirty days except to the king. When Daniel is arrested for praying, he’s thrown into a den of lions, and the den is sealed with a stone. The next morning, Daniel is still alive, untouched and unharmed by the lions. This is our hope. It’s found in God’s love for us – Christ on the cross for us in spite of ourselves. Prayer: Lord, someone, somewhere, needs you now. They are in a difficult situation. I pray that you surround them with your presence and your love. See the through their living hell. Amen. Over the last couple of years my kids have really gotten into riding roller coasters. The full gambit of emotions begins with the fear and anticipation as we wait in line, board the thing, and then travel up some giant hill, which is supplanted as we crest the hill and plunge into the exhilarating rush of adrenaline of the ride. Couple that with the sense of survival and return to peace as the ride returns to the station, and in just a minute or two your soul has gotten an emotional workout. 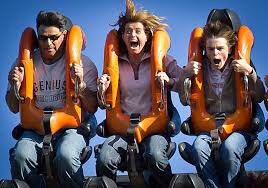 Do you ever feel like life is one giant roller coaster with all its ups and downs and twists and turn and loops? Life is like a roller coaster. You can ride it by yourself, but it so much better to ride it with a friend. In life though, we were never meant to ride alone. God is always with us and the people that The Lord brings into our lives are on this ride with us as well. Prayer: Lord, some days I love the roller coaster of life, other days I need the roller coaster to pull into the station and give me a break. Either way you are with me and have surrounded me with some pretty amazing people. Use me to encourage them, help them, and teach me to be patient with them, just as you and so many others you have sent my way have done for me. Amen. Somewhere, buried with in each of us is this sinking suspicion that we’re not good enough, of not living up to a certain standard of expectation. Along with that line of thought comes a deep sensation of unworthiness – that we are not worthy of being loved, as if love could be earned. We fear disappointing our parents, our spouse, our bosses and coworkers, and our friends. We care what others think of us. In stark contrast are the grace-filled actions of Jesus, eating with tax collectors and sinners, demonstrating God’s love for those society had judged unworthy. I find comfort in this, because God’s love for us isn’t dependent on our actions or worthiness. God’s love doesn’t wait on our worthiness. The Lord loves us anyway, no matter what. That kind of commitment in love is inspiring. When we do good, God is glorified and proud of us, but when we don’t, which is frequently, God still loves us. Jesus’ actions show that God’s love for each of us is still alive and well, whether we believe we are worthy or not. You’re not good enough to earn God’s love, but here’s the grace, God loves you anyway – earned or not. Prayer: Lord, thank you for loving me anyway. Amen. Let’s be honest. This forgiveness thing Jesus keeps talking about is hard work. Forgiving others isn’t natural for most of us. Most of us harbor resentment against at least a few folks. Forgiveness is the bridge that Love builds to conquer the divide between us. So, this is a simple but difficult challenge. Who do you need to forgive? The simplest way to find out is to search your soul for resentment. Spend some time, figuring out the “who” you need to forgive. Then, spend some time figuring out “why” the resentment is still there. Finally, if your human you may need help with this step, ask God to help you forgive. Remember the cross? God is amazing at this whole forgiveness thing, so ask the expert to show you the way. Prayer: Lord, forgive us our sins, as we forgive those who sin against us. Amen. When I was in college, we used to go out to eat at Fazoli’s because they had all you could eat spaghetti for $3. One of my friends used to order the spaghetti and water. He would then take his water cup and fill it with Coke at the soda bar. It always bugged me, and I’ll admit, it’s because he always got away with it. But today’s verse above points out the bigger issue. I know, stealing a coke is small thing, but it’s still dishonest. How can folks trust us if we are dishonest in the small things in life? We can rationalize all of the short cuts in life to get ahead. It’s only a little thing. I think Jesus point is that the little things matter, because they point to larger issues. It’s easy to say to ourselves, well, I’m not hurting anyone, so it doesn’t really matter. The truth is, it does matter. The little things in life do matter. I remember how my single parent mom, worn out from work, would listen intently to the story of my day. On single day, this may seem like a small thing, listening to others. But over time, it revealed the depth of her love for her children, and taught us, by example, and important value – Love listens, even when you don’t feel like it. Here’s my conviction today, can I be trusted with the little things? Because they do matter. Prayer: Lord, help me do right in the seemingly small areas of my life. Help me to be the person you created me to be each and every moment of every day. Use my imperfect example to lead others into the ways of your love and grace. I tell them, “I don’t believe in that god either.” I believe in the God most fully revealed to us in Jesus – The one who eats with the sinners and washes the feet of those who would betray him – That’s the God I need. After all my mistakes and sins, what I most deeply need to hear over and over again is that God still loves me, even though, even when – forever. Period. That’s the definition of grace. God still loves you, even though you _______, and even when you _______. Get it? Do you feel far off from God? Do you feel like God has never loved you, or couldn’t anymore? We’ve all felt that from time to time, even the deepest of believers and people of faith. Here’s the truth, and Jesus is the proof: God still loves you, always has, and always will. Not once you get your life right or try harder, God loves you completely, right here, right now, today. Verses like these from Luke 15 are an incredible reminder of the lengths God will go to in order to remind you that God loves you. You are loved, even when you feel unlovable. That’s Grace for your daily grind. Prayer: God, I don’t know why sometimes, but you, your love, you have never given up on me. Never. Thank you. Amen. the floods raise up a roar! A faithful friend of mine has had a rough go of it lately. He’s received difficult news about his dad’s health and his family is facing some additional challenges in the near future. It seems the floods of life have come pouring in. Nobody said life would be easy, not even for followers of Jesus. The rains will come. That’s what makes scripture like these verses above from Psalm 93 so powerful. In the midst of trouble, the psalmist sees the bigger picture, a picture with a view of eternity, and finds strength in God’s grace, God’s love, and God’s power which is “mightier than the sound of much water, mightier than the sea’s waves”. We all go through rough times like my friend. For folks who believe in God, our faith gives us hope in tough times. The challenge comes when we are going through the “flood”. In the midst of the hard days and difficult times, can we see God at work. I’m convinced that’s when God works the hardest, whether we can see it or not. So, if your reading this and going through a hard time, read Psalm 93 again and again and again. If you are reading this, and life is going smooth right for you right now, I want you to do two things. 1. Reach out to someone going through a hard time; let The Lord work through you help them, and 2. Tuck away Psalm 93 are verse you can go to when the floods come into your life because you know that sooner or later the difficult days will come to you. Prayer: Lord, rescue those who feel overwhelmed by the floods of life. Use us as instruments of your grace and peace to reach out to those who are having a bad day, a bad week, or a bad year. Amen. Self-sufficiency. Maybe it’s a shortcoming for you like it is for me. Maybe we’ve been going about this all wrong. The more I read my bible, the more I’m convinced God never meant for us to go it alone. The Three Musketeer theme, “All for one and one for all”, comes up over and over again. We were created to be dependent on the Lord and to be dependent on each other. This is one of the things I love about being a part of the faith community known as the Church. We celebrate together and we suffer together. We rejoice together, and we regret together. So, let’s do this together. You pray for me, and I’ll pray for you. Leave me a comment or shoot me message and let’s pray for each other. Prayer: Lord, I like to believe I am autonomous and independent, but that’s not how you created me to be. Help me to help others, and teach me to allow others to help me. Hear us as we prayer for each other. Amen. “That old law about ‘an eye for an eye’ leaves everybody blind. The time is always right to do the right thing.” – Martin Luther King, Jr. In today’s scripture, Jesus heals a woman on the Sabbath, and the leader of the synagogue is livid. Jesus is breaking the rules (at least as the synagogue leader has interpreted them). Jesus then speaks jarring word to those who were there that day and to us. He starts by name calling. Hypocrite has never been a term of endearment. I included the above quote from Martin Luther King, Jr., because it sums up what Jesus is saying. It’s also a lesson I try try to practice in my own life and teach my children. Figuring out the “right thing” to do is usually fairly simple and easy. Doing the “right thing” is often difficult. Simple, but difficult. Where are you being challenged to “do the right thing” today? This is your invitation to take on the difficult task. Prayer: Lord, grant us the wisdom to know what is right, then give us the courage to do it. Amen.